CHAOTIC SCENES surrounded Dublin’s O’Connell Street in February as members of an extremist far-right organisation were chased off the streets by anti-fascist activists after a failed attempt to hold an anti-Islam rally in the capital to try and launch an Irish branch of Germany’s PEGIDA (“Patriotic Europeans Against the Islamisation of the West”). 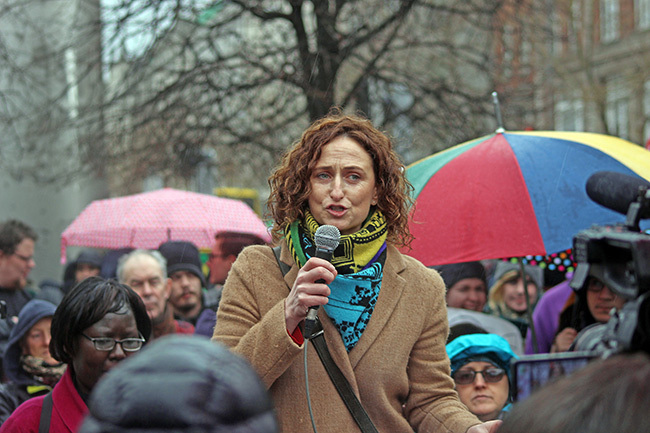 Running clashes took place on the fringes of a larger and entirely peaceful anti-racist rally on Dublin’s O’Connell Street called to oppose the bid by anti-immigrant group Identity Ireland to set up a PEGIDA organisation in Ireland. 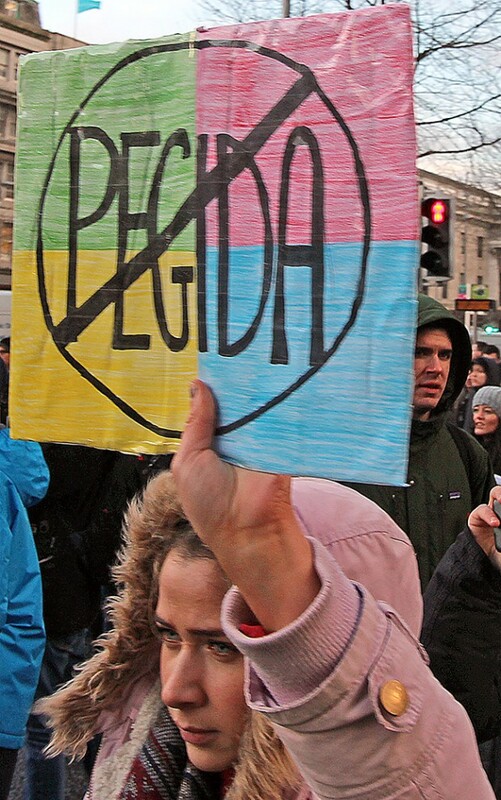 PEGIDA has been involved in large marches in Dresden and other German cities against Islam and in support of what it calls “Judeo-Christian culture”. PEGIDA, however, has also faced determined opposition in Germany. The “brains” behind the attempted launch of the Irish branch of PEGIDA are shadowy (and tiny) Identity Ireland and its leader, Peter O’Loughlin. Identity Ireland has attempted to play on public fears about immigration by claiming that 90% of asylum seekers are “bogus”. It wants Ireland to leave the EU and an end to immigration, coupled with the “deportation of all illegal and criminal migrants”. 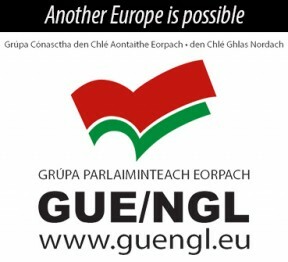 O’Loughlin first appeared on the scene when he ran as an Independent candidate during the 2014 European elections in Ireland South, taking just 1% of the vote. He later contested the Carlow/Kilkenny by-election, taking 1.4% of the vote. Identity Ireland officially launched in July 2015 in Buswells Hotel in Dublin. Its launch, which coincided with the fourth anniversary of the massacre of 77 people by far-right Norwegian extremist Anders Behring Breivik, was disrupted by protesters who accused them of being little more than a thinly-veiled racist group. Identity Ireland denied it had chosen the date to coincide with the anniversary of the Norway attacks. Other notable members of Identity Ireland are Ted Neville, a veteran of the Immigration Control Platform and who contested elections between 2002 and 2011 as an Independent on an anti-immigration ticket in Cork South Central, never achieving more than 1.5% of the vote. So desperate is Identity Ireland to find others who share its views on immigration and Islam that it is willing to cosy up to groups in Britain who are outrightly hostile to Irish people. Identity Ireland even held a joint press conference with Tommy Robinson, founder of the notorious street hooligan group the English Defence League and now an organiser for PEGIDA in Britain. The EDL has been involved in street violence against minorities in Britain and in stoking anti-Irish racism. This included attempts by the EDL to disrupt a Cairde na hÉireann event in Liverpool to remember Irish trade unionist Jim Larkin. The EDL also has links to loyalist groups in the North of Ireland. 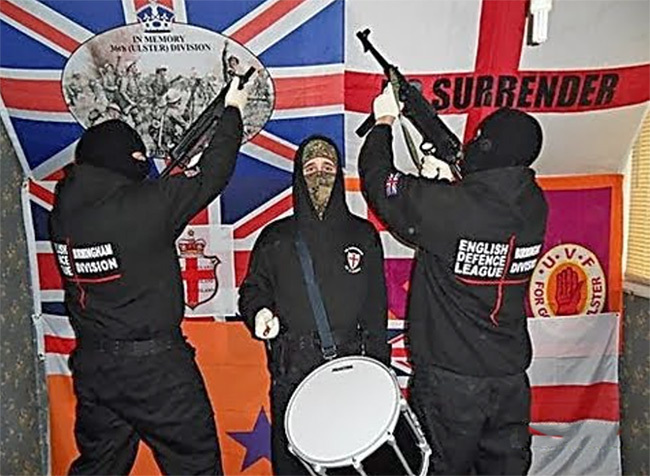 In 2011, men claiming to be part of the EDL’s Birmingham Division posted photos online showing them posing with firearms in a room adorned with EDL and Ulster Volunteer Force flags. “We need to be extremely vigilant about the insidious creeping of racist policy into the mainstream.